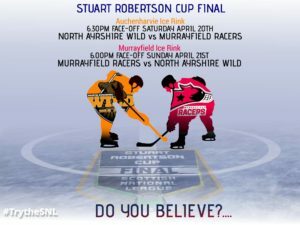 Yesterday we released the Murrayfield Racers away fans allocation for The WILD’s home leg of the Stuart Robertson Cup Final. These SOLD OUT within 2 hours. 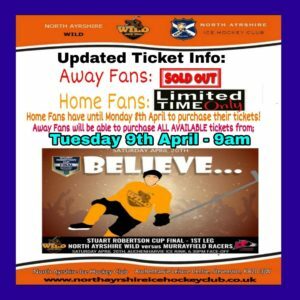 The decision was made to have a cut off date for WILD fans to purchase tickets to enable us to allocate any unsold tickets to Murrayfield Racers to allow them to come along. WILD supporters have UNTIL Monday 8th April to purchase tickets. Any available tickets left after this date will then be available for Murrayfield Racers fans to purchase via our website from TUESDAY 9th APRIL at 9am. Please bare with us; although we have tiered seating and additional standing areas around the rink, we are limited with numbers by the Ice Rink for Health & Safety Reasons and we have to abide by this for everyone’s safety. 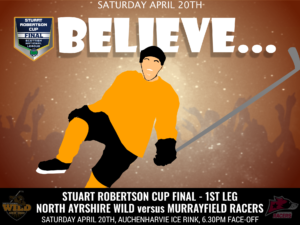 North Ayrshire Wild & North Ayrshire Ice Hockey Club are looking forward to welcoming all fans to fill our rink and watch the 1st of two fantastic finals to decide the winner of the STUART ROBERTSON CUP.